The first Fighting Fantasy book, released in 1982. 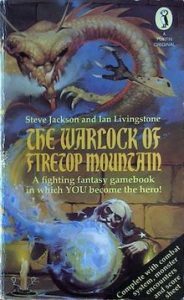 Last year marked the 35th anniversary of the release of The Warlock of Firetop Mountain, the very first of the Fighting Fantasy choose-your-own-adventure books. Since their worldwide bestselling heyday in the early to mid-1980s (20 million copies sold and counting), this classic series of books have been in and out of print, to varying degrees of success. 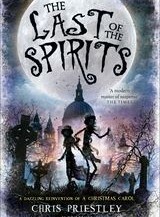 Scholastic books are the latest publisher to tackle the series, in an attempt to bring Fighting Fantasy to a new generation of fans. 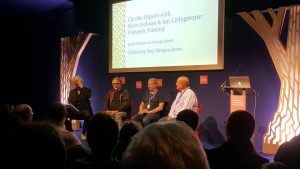 The two events at the Edinburgh International Book Festival on Sunday 12th August were testament to the fact that Scholastic might just have succeeded in bringing Fighting Fantasy and its creators, Steve Jackson and Ian Livingstone, to a new audience. I first read a FF book when I was 8 or 9 (Caverns of the Snow Witch; I still love it) and read them relentlessly for the next five or six years. 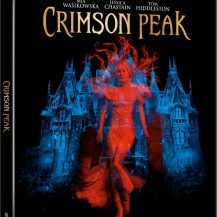 They were a massive influence on me, infusing me with a love of fantasy and gaming, and definitely in terms of inspiring me to try creative writing (still trying 30 years on, to mixed results). 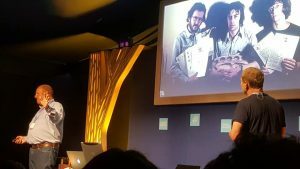 Steve Jackson and Ian Livingstone are the masterminds behind the Fighting Fantasy series, a project that was born out of their love for roleplaying games (aka RPGs), Dungeons and Dragons in particular, and their desire to try and translate those gaming mechanics to a younger audience. 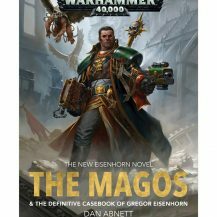 Prior to Fighting Fantasy, they had founded Games Workshop, steering it from its origins as a stockist and distributor of boardgames and RPGs (including being the original distributors of Dungeons & Dragons in Europe) to the worldwide Warhammer phenomenon of today; Games Workshop recently recorded their most successful year of trading yet. The two events on Sunday were all about bringing Fighting Fantasy to a new generation. The programme notes for the afternoon event, Fighting Fantasy with Steve Jackson & Ian Livingstone (sold out weeks ahead of the festival opening), which I introduced, promised an “interactive audio experience in which you become the hero.” Steve and Ian had created an audio adventure, operated from Steve’s laptop, and designed in the solid tradition of the FF books. Steve had also brought along some large toy dice for audience participation. After Ian had done a short slideshow detailing the history of Fighting Fantasy, Steve asked for volunteers from the audience – one to be the ‘hero’, and one volunteer each to roll the hero dice and the creatures dice. Ian Livingstone gives a short slideshow history lesson on all things Fighting Fantasy. Some suitably atmospheric audio chapters were played out, with Steve moving things along and prompting the encounters, and Ian on creature duty. The young volunteers – Daniel, Calum and Ruaridh – were full of enthusiasm, and there were lots of improvised moments of japes and mischief, which were handled in good nature by Steve and Ian, especially when the chapter order in the audio adventure became a little muddled. As I discussed with Steve after the event, these kind of technical hiccups only add to the good atmosphere. There was a tight time slot for audience questions towards the end of the event (always sure to keep seasoned book fest hosts like myself on our toes), and there was no shortage of hands up from the audience, with a good mixture of questions from veteran geeks from the first days of FF, to the inquisitive minds of the new generation of fans. Ian commented later that it particularly pleased him to see such a good, healthy mix of old and new fans alike. The signing queue in the Children’s Bookshop at the festival lasted approximately an hour, and again was a lively mix of veteran FF fans with pile of vintage books, and younger fans taking their first steps into the Fighting Fantasy series, clutching the shiny new additions published by Scholastic. After the event there was opportunity for me to talk freely with Steve and Ian, and it was interesting to get their perspective on the rise in popularity of boardgames and RPGs, such as the notable successes of Dungeons & Dragons, and the continued high grade quality output from Games Workshop. Later that day, Steve and Ian were part of an event along with Charlie Higson, titled Charlie Higson with Steve Jackson & Ian Livingstone: Fighting Fantasy. The evening event, where Charlie Higson joined Steve and Ian to discuss Fighting Fantasy, and the new additions to the series. Higson has written The Gates of Death, a brand new entry into the Fighting Fantasy series, set in Allansia, like the bulk of Jackson/Livingstone fantasy set FF books. The event took place in the Sparkes Theatre on nearby George Street, and was chaired by illustrator Tom Morgan-Jones. This event was more discussion led than the earlier one, with the three authors and their host quizzing each other on the long history of Fighting Fantasy, and the addition of new titles to the series; last year Livingstone penned The Port of Peril, whilst this summer has seen Higson’s entry released to some acclaim, alongside reissues of some of the classic FF titles. Ian opened the event with a variation of the slideshow that began the afternoon’s event. Higson discussed how he came to write a Fighting Fantasy book, and the design process of the books was explained (the diagrams from the authors own sketchbooks were something to behold, looking more like complex scientific formula than fantastical adventures!). Like the earlier event, the audience here was a good split of young and old (and I recognised a fair few faces from that event in attendance here too). 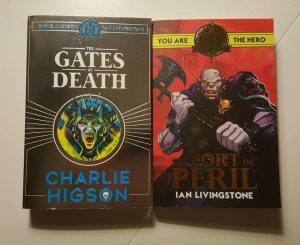 Figjting Fantasy for a new generation: The Gates of Death by Charlie Higson, and The Port of Peril by Ian Livingstone. There was a good amount of questions asked at the end, and some fascinating bits of trivia came to light through the authors’ answers; Higson explained that Jackson and Livingstone had allowed him to write an Allansia-set adventure, meaning that aside from themselves, he was the first author to write an adventure set in that realm; Steve Jackson is working on a new FF book, but was tight-lipped on the details, other than it is expected next year; Charlie Higson gave his view on why and how Tolkien’s Lord of the Rings became a worldwide bestseller in the 1970s, with the development in printing techniques allowing for all three books to be released as one volume, which until 1972 had not been possible; Ian Livingstone revealed that one of the driving reasons behind the creation of the Warhammer Fantasy and Warhammer 40k universes was that Games Workshop went from being the sole distributors of Dungeons and Dragons to being one of many distributors, and that there was a desire to create settings that were unique to the company. It was ultimately a day of celebration of all things Fighting Fantasy, and it was a pleasure and honour to have been involved in some small way. 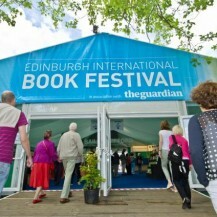 The Edinburgh International Book Festival, and the Children’s Programme Director, Janet Smyth, are to be praised for their vision in getting these events co-ordinated. On the evidence of these two events, the continued success of Fighting Fantasy seems in a healthy position. The Gates of Death by Charlie Higson is out now. The Port of Peril by Ian Livingstone is also out now, as are a number of other Fighting Fantasy titles, all published by Scholastic. Tom Morgan-Jones’ first picture book is out now, called The Red Dread, published by Barrington Stoke.